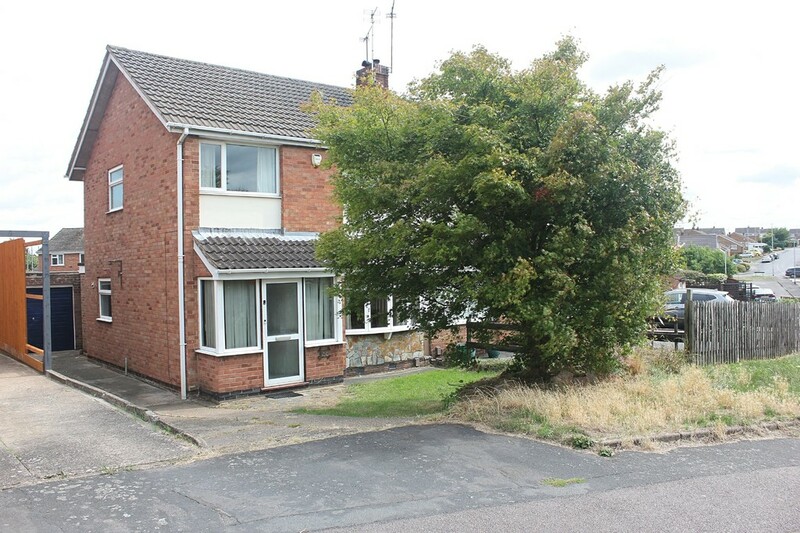 An extended semi detached family home located on the popular Little Hill estate in Wigston. The accommodation comprises entrance hall, lounge diner, kitchen diner, utility area, three bedrooms, bathroom, gardens to the front and rear, driveway providing off road parking and detached garage. The property is being sold with ‘No Upward Chain’. For more info or to view call Phillips George on 01162168178. SUMMARY An extended semi detached family home located on the popular Little Hill estate in Wigston. The accommodation comprises entrance hall, lounge diner, kitchen diner, utility area, three bedrooms, bathroom, gardens to the front and rear, off road parking and detached garage. The property is being sold with ‘No Upward Chain’. For more info or to view call Phillips George on 01162168178. ENTRANCE HALL With under stairs storage cupboard, coving to the ceiling, dado rail, stairs off to the first floor, telephone point, radiator and thermostat. LOUNGE/DINER 21′ 7" x 11′ 8" max (6.58m x 3.56m) Having laminate floor, fireplace, bay window to the front elevation, coving to the ceiling, t.v. point and telephone point. KITCHEN AREA 15′ x 8′ 10" (4.57m x 2.69m) Comprising base and wall mounted units with complementary work surfaces, built in double oven and gas hob, sink unit with drainer, tiled splash backs, tiled floor, coving to the ceiling and windows to the side and rear elevations. DINING AREA 11′ 6" max x 9′ 8" max (3.51m x 2.95m) With tiled floor, coving to the ceiling, radiator and patio doors to the rear garden. UTILITY AREA 7′ 5" x 4′ (2.26m x 1.22m) With plumbing for washing machine. LANDING With access to the loft, window to the side elevation and dado rail. 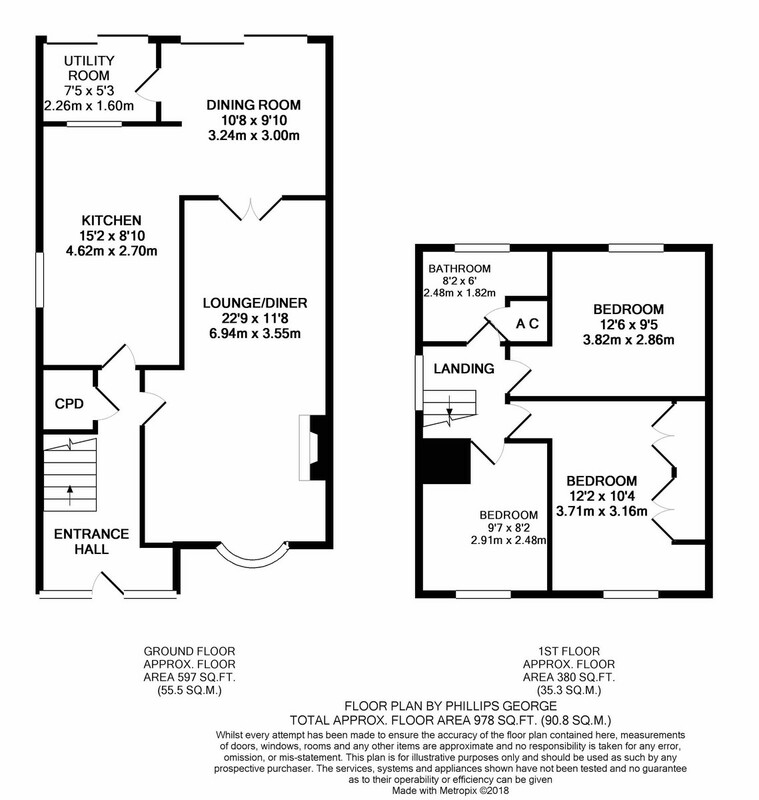 BEDROOM 12′ 2" x 9′ 11" max (3.71m x 3.02m) Having built in wardrobes, laminate floor, window to the front elevation and radiator. BEDROOM 9′ 11" x 8′ 2" (3.02m x 2.49m) With laminate floor, telephone point, window to the rear elevation and radiator. BEDROOM 9′ 7" max x 8′ 2" max (2.92m x 2.49m) Having laminate floor, window to the front elevation and radiator. BATHROOM 8′ max x 5′ 6" max (2.44m x 1.68m) Comprising panelled bath with electric shower over, pedestal wash hand basin, low flush w.c., airing cupboard housing the combi boiler, tiled splash backs, tiled floor, coving to the ceiling, radiator and window to the rear elevation. OUTSIDE The front of the property has a lawned area and is mostly paved to provide off road parking. The rear garden is mainly laid to lawn with patio area, garden shed, patio are and a fenced surround. The garage has an up and over door, single glazed window to the rear elevation and a courtesy door to the rear garden.